THE Edmonton Corn Maze presents the "Farm of Fear" event this Halloween (Oct. 18-20, 25-28, 30-31/ 7-10PM), which will use actors, spooky surprises, props, and an eerie cornfield to "help set the mood and turn an ordinary farm yard into the 'Farm of Fear'." Admission to the corn maze (which is adjacent to the "Farm of Fear") is $12.50 and includes admission to the "Farm of Fear," which is recommended for ages 12+. For a map to the maze click here. (See video below). ON Saturday, Oct. 27 you can join some 5,000 other locals for "Canada's largest costume party," the 14th annual "Halloween Thriller" at Edmonton EXPO Centre (7515-118 Ave.), presented by 104.9 Virgin Radio. The giant costume party will include eight DJ's spinning club, Top 40, hip-hop, '80s, rock, reggae, and old school beats starting at 8PM. General admission is $49.95 ($5.50 service charge), while VIP tix are $79.95 (+ $7.90 sc). THE 20th annual "Halloween Howler," presented by The Bear 100.3, will take over the Shaw Conference Centre (9797 Jasper Ave.) this Friday, Oct. 26, featuring live performances from Our Lady Peace, I Mother Earth, and Monster Truck, as well as DJ Harman B. There will be $1,000's in costume contest winnings, in addition to a $20,000 cash door prize! Tickets for the concert are $55 (+ sc). THE Bear 100.3 will also welcome back the annual "Halloween Howler Pubcrawl" the following Saturday night (Oct. 27), for just $20 a ticket. Edmonton's largest pubcrawl is expecting thousands of partygoers that'll celebrate the Halloween spirit in 15 locations, including Lucky 13, The Public House, Cook County Saloon, and both The Pint locales. There will also be a 2nd pubcrawl on Wednesday, Oct. 31 ($20). JOIN Dr. Jekyll & Mr. Hyde down at the all-ages (recommended for 14+ during later hours) "Halloween Spooktacular" at Fort Edmonton Park (7000-143 St.) on Friday, Oct. 26 (5:30-10:30PM) and Saturday, Oct. 27 (5:30-10:30PM). Tickets are $20 at the gate, $18 online, and another $10 will get you into a screening of the classic Night of the Living Dead film at the Capitol Theatre that Saturday (10:30PM). 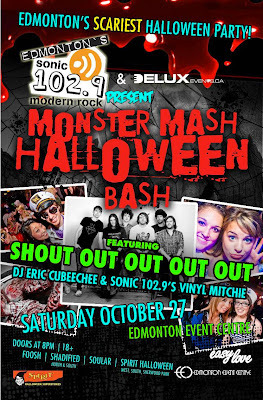 FOR $32 (+ $4.06 sc) you can check out "Edmonton's scariest Halloween party," Sonic 102.9's "Monster Mash Halloween Bash," on Saturday, Oct. 27. 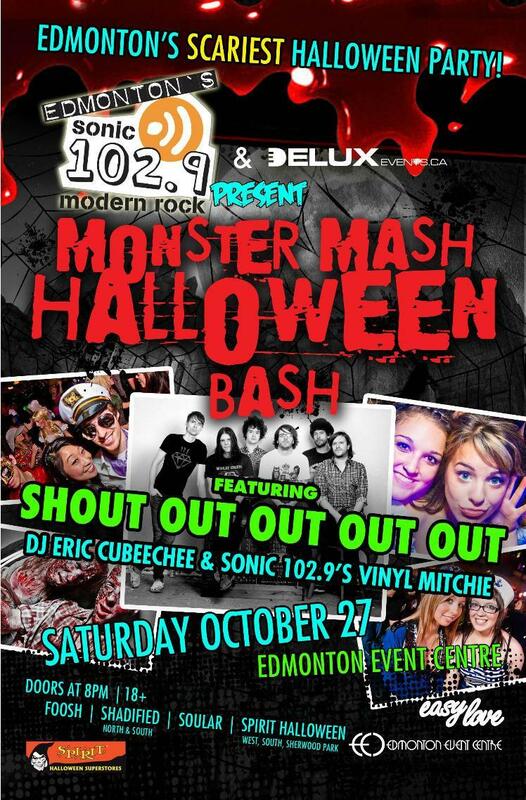 Shout Out Out Out Out will headline the Edmonton Event Centre (in West Edmonton Mall) show, but the 18+ event will also feature DJ Eric Cubeechee and Vinyl Mitchie. Doors open at 8PM. 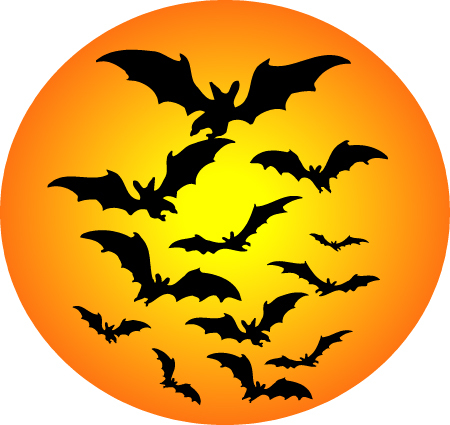 THERE will be an all-ages "Spooky Treat Stop Scavenger Hunt," a "Pumpkin Patch Prize Hunt," and an "Extinct Animal Graveyard" at the Edmonton Valley Zoo's "Boo at the Zoo," on Sunday, Oct. 28 (11AM-$PM). Tix are $8.90 ($5 for ages 2-12) and also include crafts, airbrushed tattoos, a monster mural, spooky music, magic shows, Glow Poi demonstrations, and more. The zoo is located at 13315 Buena Vista Road (87 Ave.). THE Shaw Conference Centre (9797 Jasper Ave.) hosts the 9th annual Boodang "Halloween Massive: Scream" on Saturday, Oct. 27 (8PM-6AM). The 18+ show will feature "multiple stages, amazing decor, lights & sound," and DJ's like DJ Hardwell, Showtek, and Dallask. Tickets are unfortunately sold out, but perhaps you know someone?! Costumes are recommended, but not required. THE Stollery Children's Hospital will benefit from the proceeds of this year's "Haunted Hike," which will take place again on Friday, Oct. 26 and Saturday, Oct. 27 (starting at 6PM). The $2 event is a no-car zone, so you must catch one of the "scare buses" from Strathcona Station, starting at 6PM. The last bus to the Hike will depart at 9PM. Various other Edmonton clubs, bars, and pubs will be hosting their own Halloween events as well, including The Treasury Vodka Bar & Eatery ("Haunted House Party" on Friday, Oct. 26, "Sinners Playground" on Saturday, Oct. 27, and "Jump Smokers" on Wednesday, Oct. 31), Twist Ultra Lounge ("Halloween Saturday" on Oct. 27), Diesel Ultra Lounge ("Halloween Saturday" on Oct. 27), Empire Ballroom ("Halloween Saturday" on Oct. 27), Union Hall ("Halloween Saturday" on Oct. 27), Buddy's Niteclub ("Halloween Saturday" on Oct. 27), Flash Nightclub ("Halloween Saturday" on Oct. 27), Oil City Roadhouse ("Halloween Saturday" on Oct. 27), The Haven Social Club ("Haven Halloween Party" on Saturday, Oct. 27), Wunderbar ("The Frolics Halloween Bash" on Saturday, Oct. 27), The Common ("Halloween Costume Dance Party" on Friday, Oct. 26, and "Terror on the Dancefloor" on Saturday, Oct. 27), Rouge Lounge ("A Moulin Rouge Halloween" on Saturday, Oct. 27), Buffalo Underground ("Halloween Saturday" on Oct. 27), and Azucar Latin Nightclub ("Halloween Saturday" on Oct. 27). But if you wanna keep it simple and not have to dress up, then maybe you should head to your local theatre for a screening of Paranormal Activity 4, Sinister, Resident Evil: Retribution, Silent Hill: Revelation 3D, Frankenweenie, Hotel Transylvania, or The Awakening. The Metro will also screen the modern classic 28 Days Later on Thursday, Oct. 25, while Cineplex Odeon North and South Edmonton Common will play a double feature of Dracula and Frankenstein on Wednesday, Oct. 24. For local showtimes click here. Or you can just stay in and rent/order one of the scariest movies of all-time! Play safe, Edmonton! !